Dan appeared on Good Morning America this morning to discuss Randy Maidens release on bond and whether he will be allowed back into his home, the crime scene. Randy Maidens was charged with the murder of his wife, Rachel, at their Tennessee mansion. There is an outstanding order that prevents Randy from returning to the couple’s home. Dan says, “The authorities have a lot of evidence here. Why did the judge reduce bond? That was reduced to $750,000. That’s when he was released. That’s when the controversy started whether he was going to live in the house, etc. You’re entitled to bail or bond, generally. Murder tends to be a little different. But I’m not really clear as to why that bond was reduced to the point where he’s now out. We’ll have to see exactly what happens now, with regard to whether he’s allowed to go back and live in that house. He is presumed to be innocent. And bail and bond is not intended to punish someone. It’s intended to make sure they show up. Murder tends to be different. The question is going to be, even as an innocent man, can he live at the crime scene? 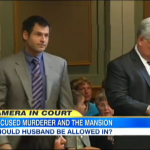 The court is saying he can.” Watch the segment here.